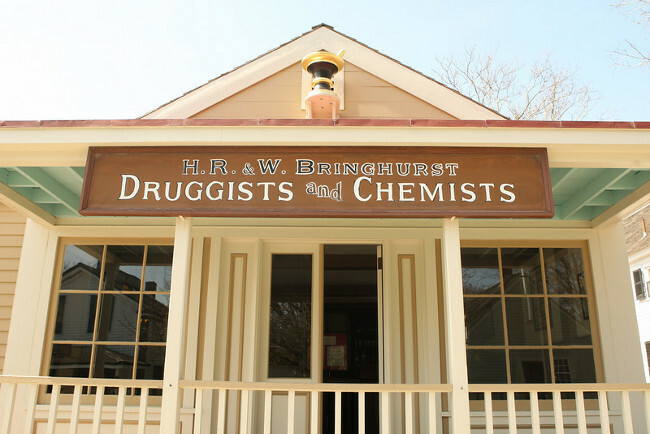 The druggist was an important man in any 19th-century community, but especially so in a seaport because he supplied the medicines and medical supplies used on ships at sea. His knowledge was greatly valued, since few ships carried a doctor and the responsibility for treating the crew fell on the master of the vessel. The seaport druggist did a substantial business in the stocking and refitting of ships’ medicine chests. 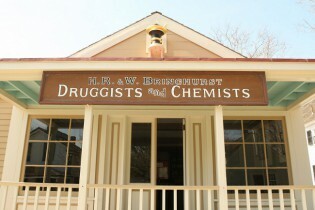 For home use, the druggist carried the popular drugs of the day and often sold spices, dyes, kerosene, and tobacco, as well as some groceries and household items. Two pharmaceutical collections are exhibited in this reproduced pharmacy interior of the period 1870-1885. The Bringhurst collection was given to Mystic Seaport by Smith, Kline & French Laboratories, which had originally acquired it following the discontinuance of the Bringhursts’ Wilmington, Delaware, store. 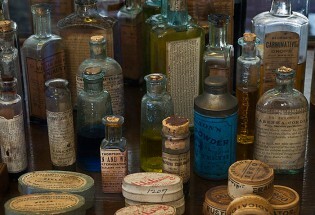 The Abram P. Karsh collection of pharmaceutical items came from the Philadelphia area. A small doctor’s office from the period 1870 to 1880 adjoins the drug store building. It is furnished with a massive Wooten desk, and rather gruesome looking medical instruments that were the state of the physician’s art in the mid-19th century.